Since early December of last year, Supply Chain Matters has cautioned our global based readers that in the current period of robust global supply chain activity, there is a need to pay close attention to the caution signs. 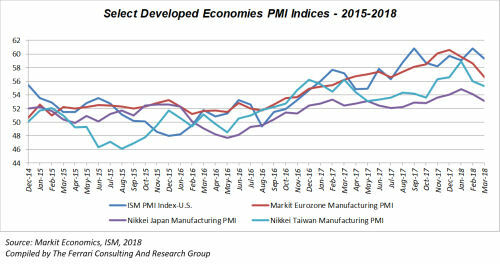 With most of the Q1-2018 regional and country-specific PMI indices now reported, those very caution signs are having a discernable impact. Normally, we provide this form of commentary in our Quarterly Newsletter available to our clients and subscribers. However, upon review, we wanted to share our observations to our broader audience. The widely followed J.P. Morgan Global Manufacturing PMI™, produced by J.P. Morgan and IHS Markit in association with ISM and IFPSM, featured a March-ending headline for global manufacturing PMI reaching a five-month low of 53.4. The data reflected slower rates of expansion both in the consumer and intermediate goods sectors, with the investment goods sectors at their highest levels in the year so-far. The report noted growth moderating in the Eurozone, China, Japan, India, and Australia. Growth improved in the U.S., the UK, Brazil, and Russia. Our Supply Chain Matters interpretation of such trending is our belief that global capacity levels have reached critical levels requiring additional investments. Other data in the report points to extended vendor lead times and shortages of input materials leading to ongoing supply chain disruption. We graphically compile select PMI indices for major developed economies which is noted in the figure below. Notice the discernable tail-off in supply chain and production output levels in Q1. The March 2018 Manufacturing ISM® Report on Business® contracted 1.5 percentage points in March with sub-indices indicating supplier deliveries and respective inventory categories declining. The report indicates that the Backlog of Orders Index reached its highest reading since May of 2004. The Prices Index was noted as a 3.9 percentage point decrease, a reflection of higher raw materials prices for the 25th consecutive month. Included commentary from select panel members indicate sub-tier components in short supply, much higher transportation costs and building concerns relative to global trade developments including added tariffs. Similarly, the respective indices for Japan and Taiwan each pointed to capacity constraints, increasing supplier lead times and order backlogs. For Taiwan, the lengthening of delivery times was reported as the sharpest since 2011. Select PMI indices for major supply chain emerging economies which is noted in the figure below. Readers will notice an even more pronounced drop-off from a base of overall activity that has been lagging the Developed regions for several quarters at this point. Some regions are on a path toward contraction, given their current trending. 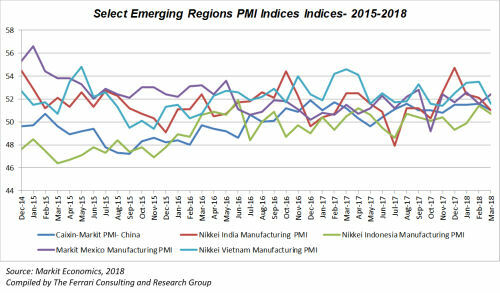 While China’s General Manufacturing PMI experienced a modest uptick, PMI activity tailed-off in India, Indonesia, and Vietnam. Slowdowns were reported in new export orders and supplier delivery times, while input costs continue to trend upward in the latter countries. An exception was Mexico with the IHS Markit Mexico Manufacturing PMI™ rising to 52.8 in March. However, input cost inflation was noted as accelerating to the strongest level in ten months, in-part attributed to Mexican peso depreciation. The level of business confidence was also noted to have fallen to a 14-month low amid concerns about inflation, financial issues, and the upcoming Presidential election. We would hasten to speculate that ongoing concerns relative to NAFTA re-negotiation talks is a further building concern. Once again, many that are experienced in boom and bust cycles know all too-well that periods of rapid business expansion bring lots of operational challenges as well as strategic risks, namely that teams take their eye away from very important tactical and strategic decisional imperatives. 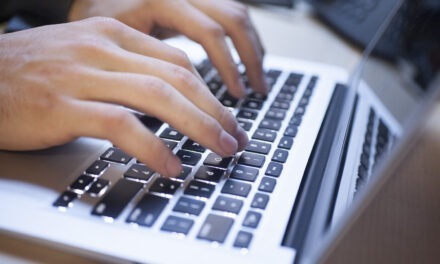 We know that it is incredibly hard for industry supply chain teams to be able to simultaneously focus on constant day-to-day challenges along with responding to line-of-business pressures for near-term expected operational performance metrics such as meeting monthly and quarterly customer service, revenue, and margin objectives. But now is not the time to ignore the broader-picture and global landscape. Strong global demand continues to test production capacity levels, especially among developed regions. That remains a clear sign that lead times for products are being extended by various domestic and global suppliers. Now, more than ever, there is a need for agility and more informed response. Contextual decision-making relative to temporary, short-term interim or permanent moves are all-important, as-is strong executive leadership. With the latest developments in global trade and building concerns relative a potential full-scale trade war occurring among the U.S. and China, businesses and agricultural interests are growing ever more concerned. That obviously leads to discussions related to contingency sourcing of products. Such discussions must factor that certain regions are constrained and have their own unique challenges. Inbound price inflation continues across most sectors and incurs additional dimensions of foreign currency fluctuations among developing or low-cost regions. Preparation, knowledge and on-the-ground intelligence are essential. A key competency is international supply management. Procurement, supply chain, sales and operations planning (S&OP) teams need to factor the realities of a highly uncertain period for the remainder of 2018. The watchword is continual contingency planning, constant scenario-analysis with the most updated information. This is a time for constant education of senior management as to a rapidly changing, uncertain global supply chain landscape. With business levels robust as they seem, senior managers will often tend to want to focus on continuing to grow top-line revenue and profitability and not want to deal with the supply chain details. That is understandable. Supply chain leaders must therefore have the capability, resources, and tools to communicate the implications to expected business outcomes as it relates to constrained global capacity, elongated lead times, added costs and a very uncertain geo-political trade environment in the coming months. The watchword is indeed exhibiting simultaneous supply chain agility and resiliency response. This is a period that is sure to test individual businesses and their their respective end-to-end supply chains.